Lately, there has been an uproar in the dog community. A researcher has discovered a link between a heart disease called dilated cardiomyopathy (DCM) in dogs and grain-free diets. The diets implicated tend to be “boutique” type or small manufacturer diets. A lack of the amino acid taurine in these diets appears to be related. So what do you, as a pet owner, need to know? Dogs can make their own taurine from other amino acids. Cats require it to be added to their diets and are known to suffer from DCM and blindness if they don’t get enough. But traditionally, vets are taught that dogs don’t need to have it added to the diet. Are the dogs being affected genetically different, thus needing more taurine? Are the diets actually deficient in the amino acids dogs would normally make taurine from? Clearly, more research is needed. The dogs that got DCM were fed these diets for months to years as their exclusive diet. Dr Leonard encourages varied diets for her patients. Ideally, you will get your pet gradually used to 4 or more foods that are in constant usage. Varying a diet this way can help to prevent deficiencies as hopefully one diet may correct a deficiency caused by another. No diet is perfect for all pets, because all animals have slightly different needs. So far, this issue as a deficiency has only been found in certain breeds, primarily Golden Retrievers, Cocker Spaniels, Newfoundlands, Saint Bernards, English Setters, Labrador Retrievers, Irish Wolfhounds, and Portuguese Water Dogs. Other breeds are known to be more likely to suffer from DCM historically, like Doberman Pinschers, but this does not seem to be a diet-related issue in those breeds. Lamb and Rice, low protein, and high fiber diets appear to be more likely to cause this problem. Other diets high in rice or barley, and those with “meal” as a main ingredient, or containing beet pulp also are implicated. Home-made, Raw, vegetarian, and boutique dog foods seem more likely to be connected to this issue according to one nutritionist. This points out why it is very important to make sure any diet meets AAFCO standards, and if you are making your own pet food it should be a recipe designed by a veterinary nutritionist to be balanced. Also, you MUST follow the recipe if it is balanced! Cheating and cutting corners can lead to nutritional imbalances. While dogs fed raw or home-made diets can be exceptionally healthy, this will only be true if the diet is balanced. Simply feeding your dog raw meat will eventually lead to deficiencies and serious health problems. Keep in mind that wolves eat more than just meat. They eat stomach contents, organs, chew on bones, and will even eat berries and nuts found in the wild. Dr Leonard suggests if you want to use a home-made diet that you use it as PART of the total food fed. Vary the diet using balanced commercial diets as well, that are labeled as meeting AAFCO nutrient standards. Signs of heart disease in dogs can include: exercise intolerance, tiring easily, coughing, increased respiratory rate, and sudden collapse. Make sure your pet is receiving full physical examinations by a veterinarian at least every six months, including a good listen to their heart. Taurine-deficiency DCM is treatable. Initially, medications for the heart disease will be started, but changing the diet and supplementing with taurine may reverse the damage to the heart if started soon enough. Dr Leonard believes that our pet’s diet (and ours as well, frankly) is THE most important contributor to their health. It is vital that we make sure our pets are fed a well-balanced diet with quality ingredients. She doesn’t believe that the diets implicated in this DCM issue are necessarily bad for all pets, but it is important to provide variety for our pets. 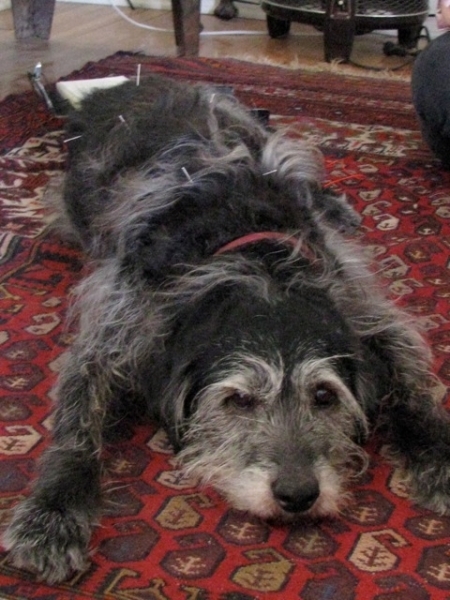 Canine Massage is again being offered in our practice August 10. Please call us at 816-331-1868 to schedule an appointment. The last two dates have been cancelled due to lack of participation. If you’d like to see us keep offering this service, please schedule your pet this month so we know there is interest. Massage for our dogs is every bit as beneficial for them as it is for us! Dr Leonard will be out of the office part or all of the day August 24 and 31. She is also going to be going to the NADAC National Agility Championships in Wyoming during September 26-October 1. Current plans are to have a relief vet filling in at the office during our business hours that week. This veterinarian will not be able to do holistic therapies such as chiropractic, acupuncture, or Chinese medicine including nutritional consults. Visits for these will need to be planned to avoid these dates. However, she is skilled at conventional veterinary medicine so will be able to check sick pets, skin and ear problems, do routine annual checkups or lab testing, and the like. We hope you will be willing to see her while Dr Leonard is gone. 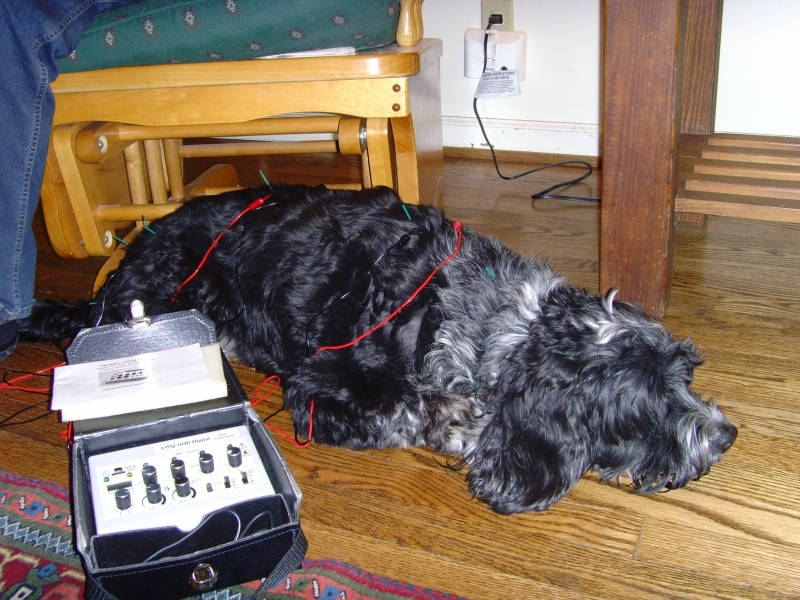 This vet is actually planning to get certified in acupuncture and possibly chiropractic in the future, so will be supportive of our clients’ approaches to pet health care and will probably be very excited to see what great clients a holistic practice attracts! We hope some of you will give her a try, as we may make more regular use of a relief vet in future instead of just not having a doctor in the office on dog show Fridays. Be sure to let us know what you think of her if you make use of her services.